When we read the book, “If the World Is a Village of 100 People,” we come to appreciate the things we have taken for granted and recognize how blessed we are. If the world is reduced to a village where only 100 people live, 25 will starve without food or shelter and 17 will be unable to drink clean water. According to the statistical report from the UN environmental plan, one billion people of the world are unable to drink clean water and exposed to waterborne epidemics. In Africa, which is suffering from the worst drought, it is common to wander for hours to try and find drinking water. Normally 1,000 to 3,000 people depend on one water pump. IWF was aware of the seriousness of the water shortage in Africa, and took an active role to help African water-deficient nations through the “New Life Family Walkathon”which had contributed to saving children with heart disease and rare diseases.The goal of this walkathon is to save lives by supplying water pumps and storages to Africa where water is desperately needed. 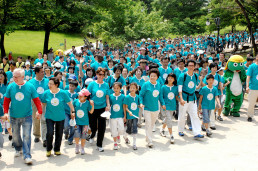 On May 25 (Sunday), 2008, at the Olympic Park in Seoul, the 10th New Life Family Walkathon was held by the IWF. The goal of the event was to save lives by supporting water pumps and storages facilities in Africa, where water is needed for their survival. On May 25 (Sunday), the 10th New Life Family Walkathon was held by the IWF, sponsored by the Ministry for Health, Welfare and Family Affairs, Seoul City and Sejong General Hospital. 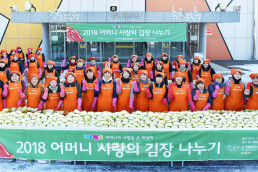 In this walkathon, many celebrities attended: IWF Chairwoman Zahng Gil-jah, IWF Chief Director Lee Gang-min and other directors, IWF Sponsor Chairman Lee Sun-jae, IWF Senior Advisor Lee Bae-geun, IWF PR Ambassador Kim Seong-hwan, IWF PR Ambassador Kim Bo-seong, Jeong Ran-hee the Representative Director of Sejong General Hospital, Jeong Yeon-bo the Secretary General of Seoul Council of Social Welfare, Professional Mountain Climber Han Wang-yong, Professional Mountain Climber Yun Gil-su, Vocalist Yun Tae-gyu, Harry A.C. van Woerden the Head of the Netherlands Foreign Investment Agency in Korea, Rundla Rusima Jimi the Counselor of the Embassy of DR Congo, John Bosco Dery the Councilor of the Embassy of Ghana, Bev. Sodan the Chairwoman of the American Women’s Club in Korea and many more. In the Peace Square of Olympic Park, around 10,000 members gathered to deliver the water of life to Africa. On the square, 100 members from the International Voluntary Service Association of Univ. Students [Daejayon] offered face-painting and ran a water-saving exhibition booth and a water PR booth. Following the New Life Children’s Choir and the marching band’s performance, Vocalist Yun Tae-gyu, PR Ambassador and Actor Kim Seong-hwan and Vocalist Kim Je-hun entertained the members by singing impromptu songs on the stage. Following the congratulating speech from IWF Sponsor Chairman Lee Sun-jae, IWF Senior Advisor Lee Bae-geun, Harry A.C. van Woerden the Head of the Netherlands Foreign Investment Agency in Korea, and Bev. 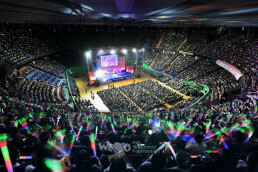 Sodan who has been doing active charity business for long in Korea as the chairwoman of the American Women’s Club in Korea, all stood on the stage. Bev. Sodan complimented the efforts of the IWF for delivering new life to children and said, “The water deficiency is a world wide issue, and annually five million people face death for the water pollution. 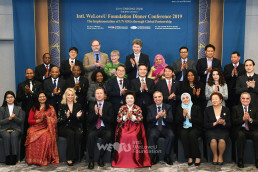 Now we, who are living together on earth, need to help each other.” She pledged to make continuous efforts together with the IWF to help neighbors in the global village. Then the expenses for setting up the water pumps and water storage facilities were delivered to Ghana, DR Congo and the Republic of South Africa. The donation will be used to set up the water pumps and storages facilities in 60 regions in the above three countries. The guests tried out a pump set up beside the stage, and wished Africa to be revived with the water of love and new life. After the ceremony, Chairman Zahng Gil-jah opened the Walkathon. A breeze cooled down the heat of early summer with the fragrance of grass, and the walking path was overflowed with the members in turquoise green shirts that looked like a flowing river. In the month of May when everything seems alive, children were full of vitality, walking hand in hand with their parents. On the walking path, various events were prepared for the participants: “Walking Hand in Hand,” “Walking While Singing Children’s Songs,” ‘Walking While Breaking Soap Bubbles,” and “Making the Shape of Heart.” Also, friendly characters like Shrek and Keroro added more fun to the events. 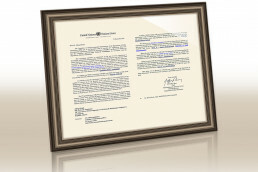 At this age when the earth suffers from serious illness caused by human selfishness, the environmental movement with the spirit of “sharing” is essential for the survival of mankind. As little drops of water gather to form a stream and then a river and then an ocean, if we respect life and gather our love and effort, the global village will overflow with love and life.